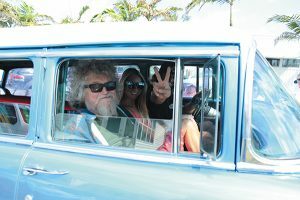 On a breezy Friday evening not long ago, Ron Heavyside sat in an old wooden porch chair in front of his Nomad Surf Shop, nursing a Coors Light and squinting west over North Ocean Boulevard at the fat orange sun sliding down toward the long yawn into dusk. Can it really be 50 years since he opened the shop? Heavyside was 19 then. He’s 69 now. The young man who surfed is an old man who sits, with half a century of triumph and tragedy behind him. But he’s still here, and so is the shop. Ronald Richard Heavyside was born in Montreal, moved to Los Angeles at 2, and arrived in Ocean Ridge in 1962, just turning 14. He never left. His father, Richard, opened a TV repair shop across the road from Briny, beside a Pure Oil gas station that later became a real estate office. The TV shop was south of the station, with the Capri Lounge, which later became Dante’s Den, to the north. While his father sold and repaired TVs, young Ron rode surfboards. And pretty soon he was building them. 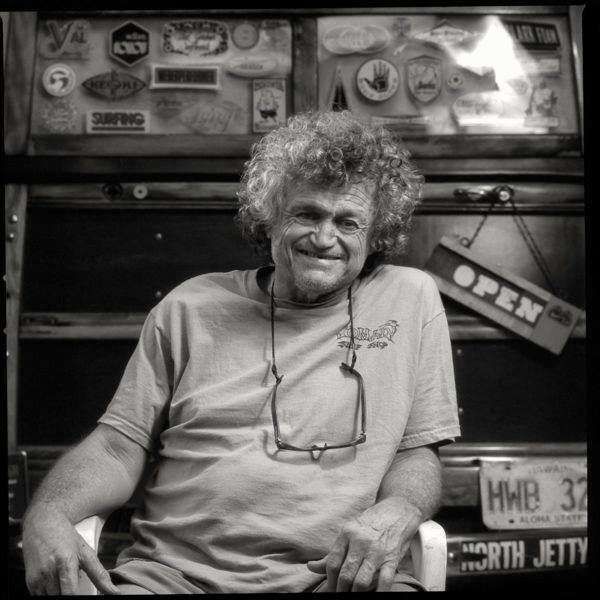 At 15, still a student at Seacrest High School, Heavyside went to work for the Caribbean Surfboard Co. on East Atlantic Avenue in Delray Beach. “Val Giersdorf hired me and I worked there through 12th grade,” he recalled. surfboards before there was a Nomad Surf Shop. “It all began with five guys and $250 each,” he explained. Pooling their money, he and his friends rented a small industrial workshop on Hypoluxo Road, bought 12 foam surfboard forms and a drum of polyurethane resin and went to work. The boards were 10 feet long at first, then the fashion changed. They shrank to 8 feet, 7 feet. “Those were easier to make,” Heavyside said. He and his friends dubbed them “Nomad” boards because the name evoked all those passionate surfers who wander the world in search of the perfect wave. This was early in 1968. Heavyside put a wall in the middle to separate the surfboards from the TV sets, bought some paneling at Lindsley Lumber, and traded a board for some shag carpeting. Heavyside sold the Nomad boards for about $175 each and the Nomad T-shirts for $3. The business flourished. At one time, he had shops in Boca Raton, Delray Beach and Cocoa. Eventually, Heavyside started selling wholesale, loading 125 boards into a U-Haul trailer he pulled up and down the East Coast behind a green-paneled Dodge Tradesman van. “I had a dealer in every damn town,” he remembered. Cocoa; Daytona; Myrtle Beach, South Carolina; Ocean City, Maryland — all the way up to Hampton Beach, New Hampshire. “I pulled into a Red Carpet Inn off I-95 outside St. Augustine one night and thieves took my truck and trailer,” he said. The truck and U-Haul were found the next morning, stuck in the sand and abandoned with the surfboards still inside. He climbed in and kept driving. In 1974, Heavyside married the former Beth Walsh, whose sales savvy helped the business grow. 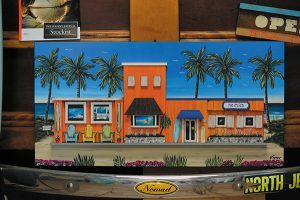 She brought bikinis and other beachwear into the shop, and by 1984 Nomad had taken over both the former gas station and lounge. The tiny corner of a TV shop had grown to a sprawling business of 8,000 square feet and annual sales nearing $1 million. The couple had two boys, Ronnie, born in 1979, and Ryan in 1984, but the 1990s brought conflict and tragedy. Beth Heavyside filed for divorce three times between 1987 and 1993, but the two always reconciled. In January 1996, the tension erupted when Heavyside changed the locks on the store. According to a 1996 report in The Palm Beach Post, the couple battled over ownership of the business and Beth Heavyside’s behavior became increasingly erratic. In May 1996, she was charged with trying to set fire to a house where she thought Ron was sleeping with his girlfriend. The following January, Beth Heavyside died. She was 47. After his mother’s death and his father’s dalliance with Jack Daniel’s, Ronnie Heavyside found himself running the business, which was already 29 years old. He’s 38 now, and still runs the business most days. Ryan Heavyside was 12 when his mother died, but he’d been surfing since the age of 5, and was ranked 11th in the boys division of the Surf America team in 1996. “When your dad builds surfboards, you surf,” he said. Today, both sons share the daily demands of running the shop. The millennium turned, the business continued to grow, and all the local kids who took up surfing as teenagers grew, too. A photograph of Ron Heavyside’s elder son, Ronnie, as a child hangs on a wall at Nomad. Jeremy Stewart was born and raised in Lake Worth. Today, the surfboards that sold for $175 in 1969 will cost you anywhere from $595 to $1,500, and the $3 T-shirts with the Nomad logo sell for $20. Somewhere along the way, the Nomad Surf Shop went from being a shop that sold mostly surfboards to a shop that sells mostly everything else. “T-shirts are our No. 1- selling item,” Ryan Heavyside said. Wander the labyrinth of aisles nowadays and you’ll find surfboards, yes, but mostly you’ll find sunglasses, sandals and watches, skateboards and paddle boards, bikinis, baggies, skirts, tops — and T-shirts, of course, a whole wall of T-shirts with more than a dozen Nomad designs to choose from. The shop hosts a food truck, parked outside every Wednesday through Sunday for healthy smoothies and juices. On St. Patrick’s Day, the store hosted a promotional “Volcom Event” out front, sponsored by the popular surfing sportswear company, with live music by the Mother Gooses, a trio from Jacksonville that travels for Volcom. In 1999, while he attended a surfing expo at the Orlando Convention Center, a modeling agent handed Ryan a business card. He was 15. He’s 33 now and travels the world to model. He’s been on the cover of the Abercrombie & Fitch catalog, and L’Uomo, a former menswear edition of Vogue. His work for Valentino, the high-end designer, was displayed on oversized photographs in the Milan airport. And when his six agents send him to London, Paris, Rome or Thailand for jobs every couple of months, surfing often goes, too. “If I fly halfway around the world for a modeling job and there are waves, I take my board,” he said. But rather than move to a place like New York to help his career, somehow Ryan always comes home to the Nomad. All the Heavysides seem to come back to the shop. 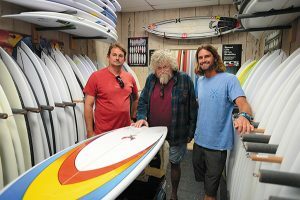 McKeral, the man who rented him that first surfboard factory on Hypoluxo Road, was right: It’s been a good business because there’s always a new generation of young surfers coming along. “It was the right place, the right time, and a lot of luck,” he explained. But now the sun had dropped so low its evening fire reached his chair, the beer was gone, and he needed to go inside. God Bless old buddy we had good times together over the years. R.i.p. Ron. You were a good friend. You will be missed. Had good times. Old days. and we both surfed South Florida many times together. He had some artistic skills too and could freehand paint just about everything and he loved being in the shaping room carving foam. Ronnie will carry on the name and traditions of Nomad. Farewell Ron. He was always a good guy. I painted his nomad sign when he first opened way back when. I remember his mom and dad too. Briney wont be the same without him. Ronald buddy old pal thanks for the job from 1975 to 1979 you were instrumental in making me who I am today. Nomad is a legendary brand dreamt up by a legendary man. I was a classmate of his wife Beth. We are celebrating our 50th high school graduation this year, and miss her terribly. She was a wild , funny, vivacious woman until Ron got her into drugs and cocaine. The business grew because of her, and still thrives because of her vision. She was a special person, and I wish her sons had grown up knowing her. Still have my Nomad 7’4″ Brewer design mini gun that you shaped for my 1974 can trip to Libertad, El Salvador. It worked especially well for me, thank you. Jay Evilscisor hooked me up with that hand shaped board and now both of of you are gone. Thanks for the stoke, and especially the sweet memories of classic surf, and boards!